Strasbourg/Agency Caucasus – Three Chechens won a legal fight against Russia after they went to the European Court of Human Rights (ECHR) in an appeal to seek compensation for their narrow escape of death early in the second war of Chechnya. The ECHR judges imposed on Russia a fine of €170,000 in compensation to Elena Goncharuk, Heedi Mahauri and Petimat Goygova. Russia will pay €67,550 in compensation to Mahauri, €54,400 to Goncharuk and €47,299 to Goygova. 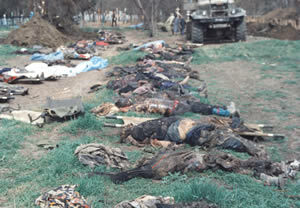 The lawsuit has it as an official account of the incident that Goncharuk and Mahauri had a narrow escape of death in January 2000 when the federal troops were out on a military operation in the Staropromislov district of Caharkala, capital of Chechnya. Goygova’s mother and sibling were killed during the operation. Russia started to fire bombs at Caharkala in 1999 when the second wave of the war began and it moved in December to the occupation of the city. There was no way to exit from the city and thousands had to stay in places vulnerable to bombings. The Staropromislov district was the first to be occupied by Russian troops. The troops killed in December tens of people, as they could not move out of their houses. Goncharuk hid along with his neighbours on the ground floor of his house on January 19. The Russian troops fired a tear gas bomb into the ground floor in a move to get all of the people out and then to kill them. Goncharuk survived the shooting, although it left five dead. After Goncharuk left Caharkala at night, he received a surgical operation in Ingushetia. Goygova was trying to get to Caharkala on January 19 when his brother Said Magomed and his mother Mariam had to be there. Goygova’s mother was injured the day before. While his brother and three others were trying to move her out of Caharkala, the Russian troops first stopped them, beat them and killed them. Goygova afterwards found the dead bodies of both his mother and his brother. Both dead bodies had bullet scars. Mahauri managed to leave Caharkala shortly before the Russian troops were ordered to go out on a mission. When he came back on January 22, he saw that his house had been destroyed. The Russian troops fired at him and two women when they were spotted at. Although seriously injured, Mahauri survived. While Goygova received assistance from the Russian Initiative of Law, Goncharuk and Mahauri from both the European Centre for Defence of Human Rights and by the Memorial when they went to the ECHR against Russia.